For some strange reason, I made 889 baseball cards this year. I’m not sure what I was thinking, That’s enough for every prospect in the system to get three Cards made of them. But that’s not how it always works. I made more of some players than others and definitely more of some levels than others. 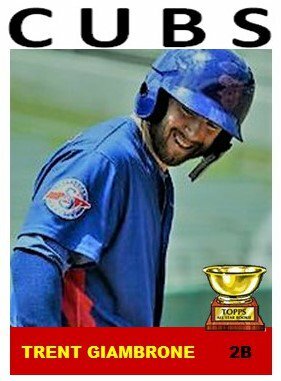 Normally, this would be the part where I would tell you about the theme and then show you a Google Slides presentation of the top 11 cards of the year. Instead, I piggybacked the cards from my top-secret Twitter burner account and are able to bring them to you without sucking up any storage space on WordPress. A lot of times light will make a card. It could be bright sunlight, it could be shadows, or it could even be sunset. In this case it is sunset. 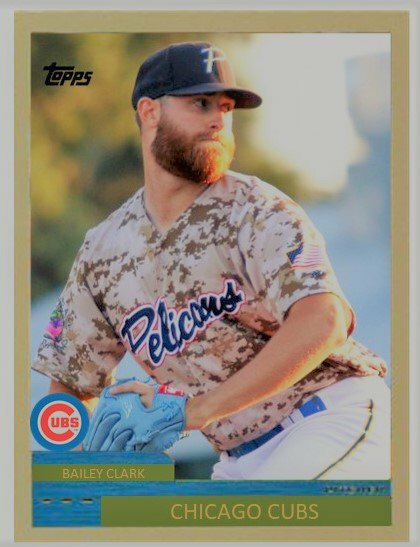 Larry captures Bailey and his wind up in a camo jersey that kind of blends with his beard and the card frame in one of my favorite shots of the year. I am not sure where this picture was taken, but the billboards blurriness in the background makes the whole shot. I also love that Thompson is in the road gray uniform of which we don’t see too many pictures. Sunday games are always best for pictures because of the large amount of sun. In this shot, Rikk perfectly captures pitcher Brendon Little in the daylight. That’s not what makes the picture, though. The earth toned crowd behind Little blends perfectly with the 2001 frame. 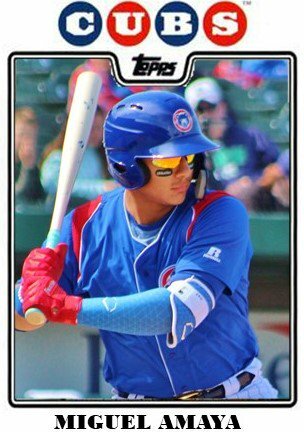 Dylan has tweeted that he does not like the red alternate jerseys worn by the Iowa Cubs. In this pic, however, that red jersey just contrasts perfectly With the black flame frame of the 1971 card. 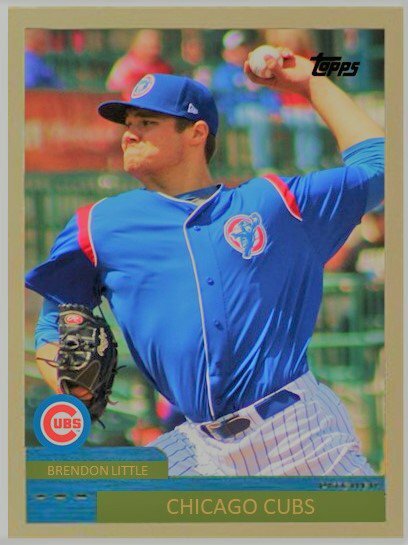 Also, I just love the action in the card. 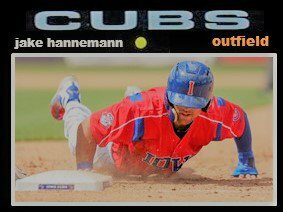 This is a perfect picture of light and color matching perfectly with the frame in a day game from early in the year. 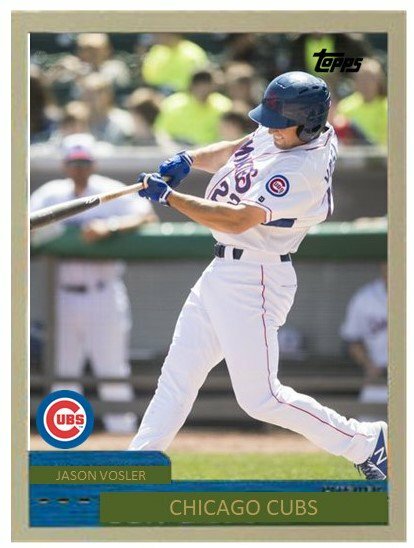 It wasn’t long after this that Vosler found his way to AAA Iowa. 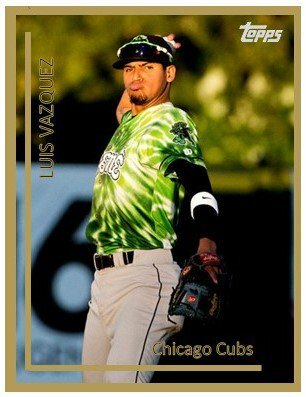 This was the card of the month for September and I just love how the light bounces off the different shades of green in the tie-dyed jersey. Taken right at sunset, it’s a magical shot! Even though Luis Diaz didn’t last at Eugene all summer, the memory of this picture did. 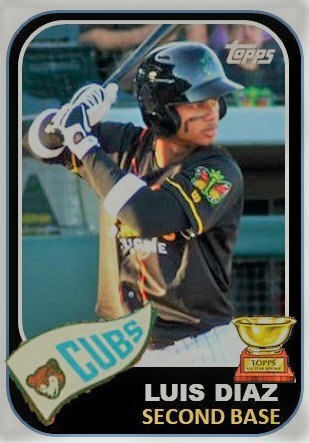 The sunlight coming in and illuminating half the hitter and the colors in the Monarcas jersey just seem to pop and it was one of my favorite cards of June. 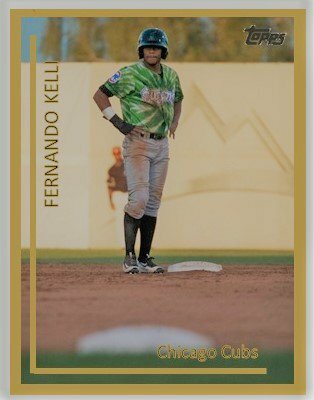 Fernando Kelli has a lot of speed. This picture by Jared really captures Fernando‘s personality as he eyes third base early in the season. It really speaks to who Kelli is and what he can do in a baseball game to change the outcome. 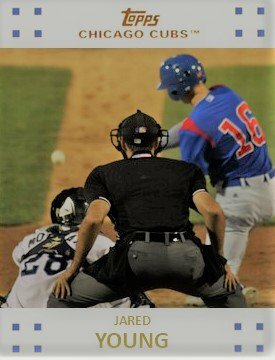 Taken in Grand Rapids, Michigan, John actually had a much wider view of the shot but when I zoomed in for the card, the angle just seemed to line up between Jared Young, the catcher, and the umpire. It really caught my eye and still does. Just look at that smile! That sells the whole card. I just love everything about this card. From the 2008 Topps’ frame to the melting of red, white, and blue throughout the card, it has a really classic look. However, some might get lost in Miguel’s sunglasses as he looks like a viper about to strike. At the time this picture was taken, that’s exactly what Amaya was doing. To see all 889 cards, head on over to the Facebook Photo Albums. 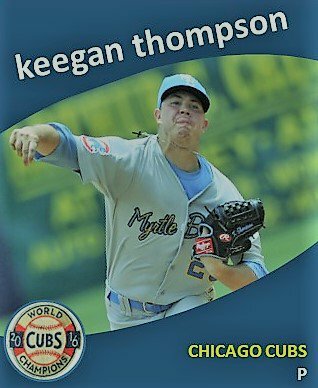 I have also begun to make some cards this offseason. If you know of any recent shots of prospects floating around a hometown paper or website, let me know.